Longtime color guard performer Chelsea Blackburn found the best way to explain winter guard to friends is to let them experience it. She shared her personal story with Marching.com. "I can't. I'm going home to Nashville this weekend." That is how I answered my roommate Rebecca's invitation to go see a movie this weekend, and it's also how I responded to every invitation, on Facebook or otherwise, for events that happened on the weekend during my college years. "Oh that's right," responded Rebecca. "You have that guard thing." I sighed. Here's my standard answer: you know those people with the flags and rifles that are on the field with the marching band? Well, it's just the flags and rifles in a gym, performing to taped music. That covers the basics and is usually enough for strangers and acquaintances, especially law enforcement. I once got pulled over on the way home from practice. It was after midnight, and I was sick with strep throat. The cop asked me why I was in such a rush to get somewhere, and I told him I was just trying to get home to get some rest. He asked me where I had been, and I gave him the typical answer. Apparently, he had never been to a football game in high school, because after I tried to explain it, he still stared at me blankly. I just told him it was basically a lot of dance. He nodded and gave me a warning. I still think he was too confused as to what I was actually doing to give me a ticket. "Did you go to football games in high school?" I asked my roommate. "Only a few times. And I usually didn't pay attention to what was going on at all. I just ran around with my friends." "So you never saw the marching band?" "Don't think so. I had friends in the band, but the band was terrible. Plus, we didn't have color guard." "Oh. Well, then, the color guard is the people who spin flags and fake rifles and dance around on the field. Winter guard is the same thing done inside." That was really the basic answer. However, I knew Rebecca wouldn't be satisfied with that answer. It really is just flags and rifles and sabres being spun in a gymnasium. But the more I tried to explain it, the more preposterous it sounded. There are tarps, giant floor coverings that are painted to match the show theme. And then there's the music  everything from classical to spoken poems to Eminem. But I have been involved in this world since my freshman year of high school, and it seemed fairly standard to me. But even those who understand it (typically band kids) don't really get it either. My freshman year the guard managed to get a silver medal at our final competition in Dayton, Ohio. We all proudly wore our medals to school the next Monday, and I was excited to hear our achievements announced over the loudspeaker as I sat in my homeroom class, medal clanking against the zipper of my jacket. After the announcements were done, I heard the confused whispers around me. "Maybe they guard against the winter!" I ignored it all until one of my close friends, a tuba player, poked me in the shoulder. "No, really Chelsea. What's winter guard?" Rebecca poked me in the shoulder, bringing me out of my reverie. "I want to know more. Is this like some cult thing?" she joked. She was from Dayton, so I asked if she knew about the huge convention that occurred in early April. "You mean all the high schoolers who come and eat in the food court of the mall near my house? Doesn't it occur at the University of Dayton Arena?" I explained that yes, those high schoolers were probably a part of it. However, other people could participate. There were two divisions  scholastic, or high-school based, and independent, meaning not high-school based. Then there are classes that are divided up based on skill level: A (the lowest), Open, and World (the highest). There were age limits in both Independent A and Open, but participants could be of all ages in Independent World. Rebecca followed most of this successfully. "But why Dayton?" Rebecca asked. "I don't really know. That's just where it's been for a long time." I explained that every April, for an entire four days, winter guards and their fans descended on Dayton, booking every hotel and reserving every gym in a fifty mile radius. Winter guard is organized by Winter Guard International, or WGI for short. WGI holds regionals throughout the season across the country, and WGI Championships is the crowning event for the winter season. The participants became completely immersed in the guard world, and I saw friends I marched with in high school and other groups. Somehow, during these four days, the real world fades away, and nothing matters but performing, watching others perform, and being in the company of those who share a passion with me. The Sunday after WGI was always a difficult time as I left behind friends, memories, and a world that understands. Usually, fight as I might, I cried in the car as I drove back to school and a world that is full of deadlines and textbooks. "So how did you get involved this year? And why do you have to go so far away to do this?" "Southern Indiana doesn't have any independent guards, and I basically emailed my way into a spot with this guard since I was in England," I replied. I had thought that marching winter guard that year was a possibility, but I sent some emails from England to a few directors saying that I was interesting in marching but was out of the country until late December. Luckily, one director was familiar with the programs I marched with in high school and the year before and told me that I would have a spot saved for me. I had returned to the States and started the now-annual pilgrimage every weekend to Nashville. My friends, now used to the idea of me being absent on the weekends, didn't bother asking where I went. Except when one occasionally forgot, like Rebecca had. "But you never get to do anything fun on the weekends, and I miss you when you're gone. And you respond cryptically to my text messages asking what you're doing. And you stay up so late trying to do all your homework on Sunday night. Why exactly do you love this so much?" Bernard asked as I sat on her bed facing her. "Whoa, slow down. I'll answer your questions. To me, winter guard is fun. I like challenging myself and getting to perform for people. I do miss my school friends, but I have friends in winter guard too." I tried to answer all her questions. I always laughed at the texts on water breaks in rehearsal from her and my other college friends. They told me what crazy social events I was missing out on, and I quickly updated them on what I was doing in practice ("Just cleaned the flag phrase for two hours," or "Had three hour dance class. Can't walk normally."). I usually did not get responses, but I chalked this up to confusion as to what exactly a flag phrase was. "Well, I usually tell you that I'm working on the flag phrase, right? The flag phrase is when everyone in the guard is spinning flag and doing the same thing. We spend so much time on it because it's the closing statement of our show and we always want it to be clean." "Clean is when all the flags go around together at the same time perfectly. It's beautiful." Rebecca looked at me dubiously. I was getting frustrated, so I decided just to show her. I pulled out all of my winter guard DVDs (yes, I brought them to college with me.). I stuck in the one of my winning freshman year. We watched it, and when it was over, I hit pause. "So, yeah, I was 14, but that's kind of the gist of winter guard." "That's cool. Are all shows that energetic and high-paced?" I stuck in another DVD that was an assortment of shows from the past ten or so years. We watched one that used the music from The Road to Perdition, slower and more drawn-out. Plus, that guard was all-male, a rarity in the guard world. After that, we watched a Beatles tribute show. As that group, primarily twenty-somethings who had been spinning for years, ended their show with exchange after exchange of flags, I excitedly hit Rebecca's leg. "Uh, yeah. That was cool too." I gave her credit for indulging in my other life. "Well, since you can't go with me to a movie this weekend, can I go home with you?" "Girl, I have winter guard practice Friday night and Saturday morning and a performance that night. You'd probably just chill with my mom and come watch me perform." "That's fine. I want to see exactly what this guard business is all about anyway." I told her we would leave around four on Friday and my mom would pick her up at my rehearsal site. Inwardly, I danced a happy dance. This was really the first time a friend outside of the guard world had wanted to come see me perform and try to understand why I shucked a social life in college for the activity. My mom picked her up right on time at an elementary school in Nashville, and I only briefly saw her Friday night before going to sleep. The next day, Rebecca and my mom met me at the show site. My mother had always helped me do my hair that season, as I couldn't tease my hair into a mohawk by myself. I had posted pictures from my show on Facebook, so Rebecca had seen pictures of me in uniform from that season, but I don't think she was prepared to give me a hug when I showed up in a satiny black dress and shiny black leggings. The underside of my hair had been dyed banana yellow earlier in February but it didn't really show until I twisted the sides of my hair up to prep for the mohawk. Rebecca chatted with me as I applied my show makeup (lots of black eyeliner and yellow eyeshadow to match my hair) and my mother teased my hair until it quite literally stood up on end. I quickly hugged both my mom and Rebecca as I rushed to meet the rest of my guard to go into warm-up. I stretched with the other seventeen members of the guard, slowly making my typically-short hamstrings lengthen so I could adequately point my toes. After body warm-up, we moved as a guard to equipment warm-up. Here, we ran things as a group and individually, and I moved through my superstitions, kissing each piece of equipment as I finished spinning it and moved on to the next. We exited warm-up and stood with our tarp (spray-painted to look like graffiti covered the gray floor) in the waiting area. We walked onto the floor and pulled out our tarp, set our equipment, and waited for the announcer to introduce us. The show itself passed quickly. I usually got tunnel vision when I performed. Everyone in the crowd went blurry, and I nearly went into autopilot mode, executing the movement that I had practiced over and over again. The crowd, made up primarily of high schoolers who competed in the same circuit as my independent group, went crazy. The show was a crowd-pleaser, invoking images of 1980s punks complete with partitions of rolling chain-link fences and crazy hair on everyone. I tried to find Rebecca and my mom in the stands as we folded our tarp and picked up equipment, but other friends were yelling, and I waved to them. I met up with my mom and Rebecca after the awards ceremony. I ran a baby wipe over my eyes, trying in vain to get off the excessive makeup. My mom had her typical critiques of the show (she once had done color guard too) and told me not to rush the last big toss of the flag feature. "So, Rebecca, what did ya think?" I asked as I scrubbed. "Uh, it's kind of surprising. I mean, you have a whole other personality that performs, it seems. You looked so happy. I think I kind of understand why you do this now. But your music was cool! I didn't really care for some of the slower shows the high schools did. Thank goodness your show wasn't slow." That weekend was a huge breakthrough for me. After that, whenever someone asked why I disappeared on the the weekends, Rebecca helped me explain that it was a performing arts thing. From then on, I had an accomplice whenever I disappeared. 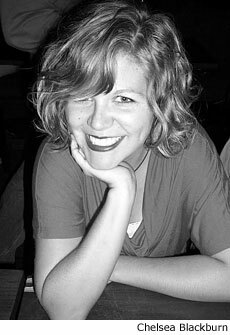 About the Author: Chelsea Blackburn is a senior creative writing major at the University of Evansville in Evansville, Indiana. While attending Brentwood High School in Brentwood, Tennesee, she performed with the school band on the field and with the winter guard. She has also performed with Southwind Drum and Bugle Corps, The Mark of NSA Winter Guard, and Eklipse Winter Guard. In 2009 she was a charter member of Music City Drum and Bugle Corps from Nashville, TN. 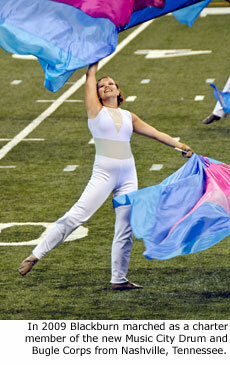 For 2010 she will perform again with Music City on the DCI summer tour. Text and images courtesy of Chelsea Blackburn.